One of the most famous, and feared, bucking bulls of all time. More feared than Mike Tyson in his prime (and just as likely to take a piece out of his opponent), Bodacious is set to become only the sixth bull inducted into the Hall of Fame. He joins such storied animals as Jim Shoulders’ great bull Tornado, Oscar, and the bull Red Rock. Most of those bulls had long careers in the rodeo game, but Bodacious had a career path as short as his temper. In 4 short years as a bucking bull, Bodacious managed to unseat 127 of 135 bull riders. A 1,900-pound behemoth referred to by announcer Bob Tallman as “the yellow whale,” Bodacious is owned by Texas stock contractor Sammy Andrews, who bought him in 1992. Twice, cowboys chose him as the PRCA Bucking Bull of the Year (1994 and ’95), and he was elected the top bucking bull of the NFR in 1992, ’94, and ’95. Always a strong bucker with an amazing vertical leap, Bodacious was topped by a mere handful of riders. Among the most spectacular rides was the 87-point effort put up by Terry Don West at the ’95 San Antonio Stock Show and Rodeo. 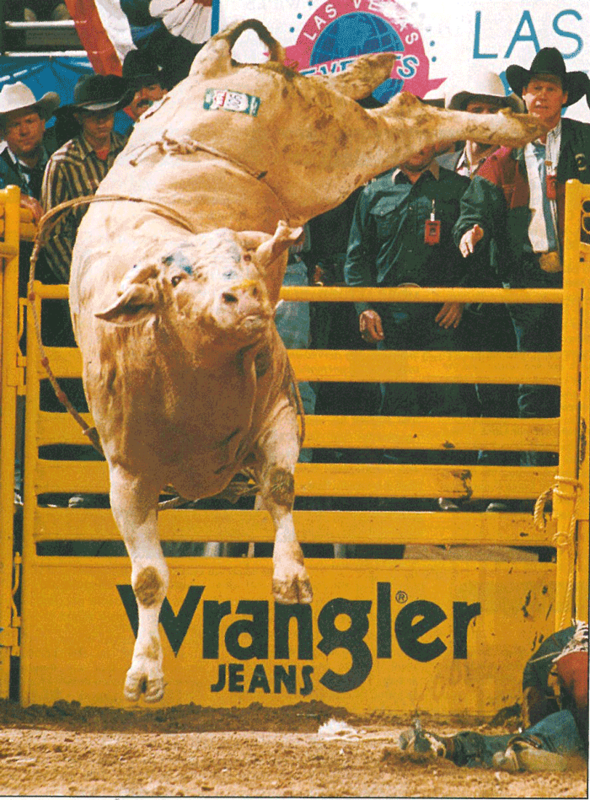 Tuff Hedeman also bested the bull (for a 95-point score), as did NFR veteran Clint Branger. All of them agreed with Andrews’ decision to retire the bull. “Of all the bulls I’ve ever seen, he’s the most dangerous,” Hedeman once told a Sports Illustrated reporter. But that same reputation for mayhem also made Bodacious a celebrity. Since his retirement, Andrews has built a cottage industry around the Bodacious T-shirts and videos that have been sold. Today, Bodacious is retired to Andrews’ ranch in Bagwell, but still gets out on the road occasionally to make public appearances. “I always hoped he would get in (the Hall of Fame) because I always thought he did a lot for the sport of rodeo,” said Andrews of his famously feared bull.